I guess you could call this a kind of 'share the blogger love' post. Except to me, Devon is more than just another great blogger, shes a friend. Let me tell you our story. 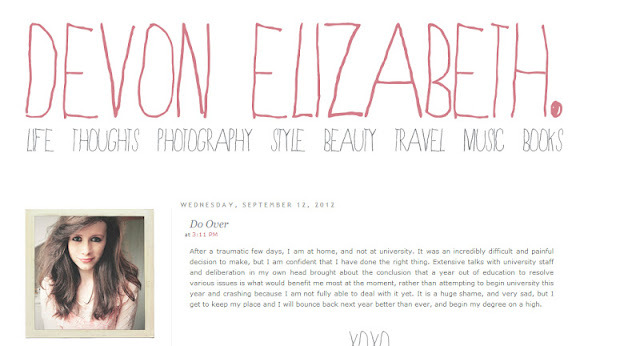 Firstly, before I even knew of blogging, I found Devon through her Tumblr. I instantly fell in love with her and felt like I got to know here through her 'facts about me' posts. Then, I started reading her blog. I felt like we were two peas separated from our pod. We both love music passionately and photography and literature. One day, Devon advertised that she wanted a email buddy, of course I instantly sent her a messaging saying I'd love to. We sent numerous emails back and forth, talking about anything and everything and I always looked forward to seeing Devon's name in my inbox. Eventually, I joined the 21st century and got myself a Twitter and started blogging, too and through these mediums we keep up to date with each others lives. 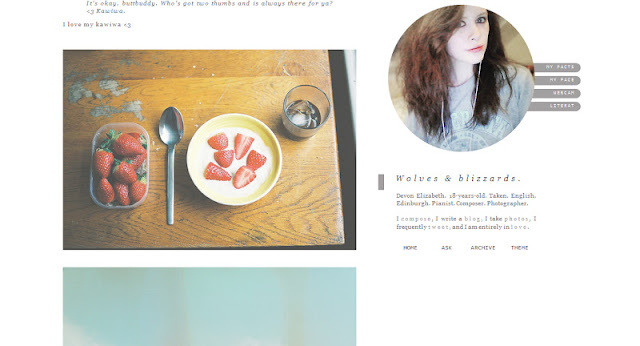 Devon blogs about everything from her day to day life to beauty, style, photography and books. Her posts are interesting, varied and always beautifully written. Often accompanied with her personal photography to add to the magic. Not only is Devon a talented writer and photographer shes also a brilliant composer. I can't explain how beautiful Devon's personal compositions are, I could listen to them for hours on end. I eagerly await her next composition as I do her blog posts. Even though Devon lives in Scotland, and I down in the South East of England, I can't help but hope one day we will meet in a little cafe, drink large mugs of tea, snuggled up in comfortable hoodies (Devon in her awesome custom Supernatural Sweatshirt) and maybe hit the local charity shops for bargains and books. Next, we will wander off on a scenic walk, cameras at the ready, naturally. We'll end our perfect day tucked in the bow of a tree somewhere with a view and a flask of tea, open books nestled in our laps. Please follow Devon's blog, twitter, Soundcloud and Tumblr. She is one of the loveliest girls on the internet and one of the most talented. You won't regret it.